The electromagnetic field extends its influence to all possible scales, creating a continuum from radio waves and chemical bonds to the oscillations of thought — experience itself. Existing all around us, it contains traces of every cosmic event since the big bang, heard as static and seen as light. Humans discovered radio by accident, as interference on telephone wires. Now we use radio waves to carry our own signals, embedding our voices and data in the noise. 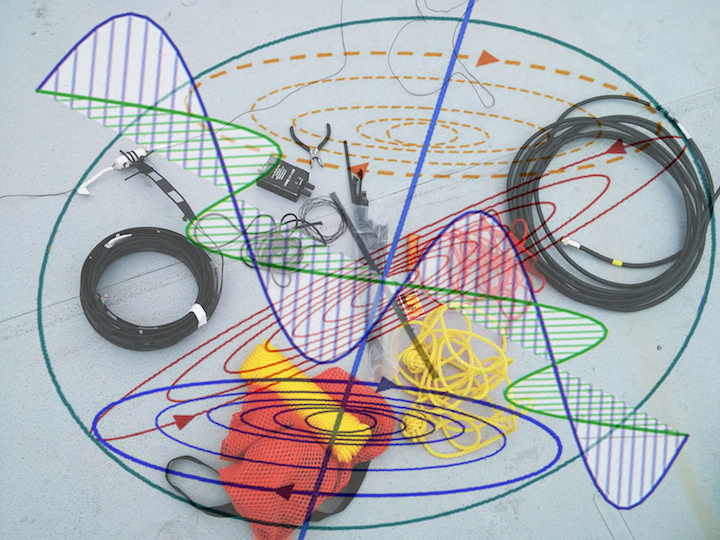 To explore the physicality of radio phenomena, Sexton installs antennas and performs a series of spatiotemporal experiments. Rope, balloons, tarps, and wires form flexible structures, allowing wind and weather to modulate site and sound. Her sensitive amateur radio transceiver and custom amplifiers pick up a wide frequency spectrum, which Sexton tunes and improvises with. She also tries to communicate with other distant radio amateurs, bouncing signals off the ionosphere with resonant copper wire.